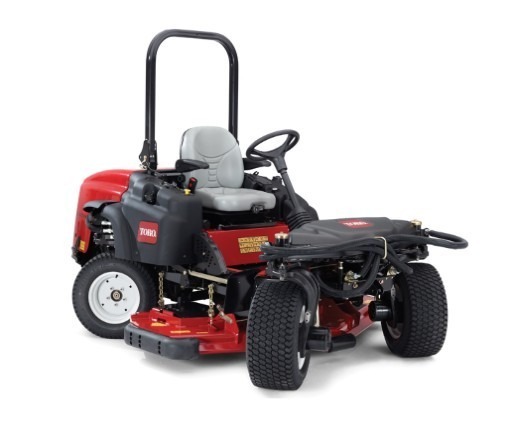 The Toro® Groundsmaster® 360 Quad-Steer™ 4WD reinvents the way a mower performs. Powered by a 36 hp (26.8 kW) Kubota® 4-cylinder diesel engine, this machine utilizes revolutionary Quad-Steer™ all wheel steering to maximize productivity. Climb hills without slipping. Make 180° turns without tearing turf. Hug the turns or side hills while mowing in total comfort. The Groundsmaster® 360 features Quad-Steer™, true, all-wheel steering to achieve unmatched manoeuvrability, control and performance. This is the most innovative steering geometry ever offered in a cutting machine. We guarantee you’ve never driven a mower like this before. Controls placed at your fingertips, exceptional line of sight forward, to the sides and rear-ward and comfortable seating. The Groundsmaster® 360 is designed with optimal operator comfort in mind. Even after hours of driving, you won’t want to quit. A wider track, combined with a hydrostatic drive system offers exceptional stability and control, even on hillsides. With the Groundsmaster® 360 there is no turf tearing when making sharp turns. *Always use caution when driving and avoid unsafe terrain. The Groundsmaster® 360 is a more productive cutting tool than anything you’ve ever owned. Not only does it cut faster, it offers maintenance and attachment efficiencies that help operators do more jobs than just cutting grass. The Groundsmaster® 360 comes with the durability you’ve come to expect from Toro®. From the Kubota® engine to the superior deck construction, you can count on years of performance.